- 12 book clamps traveling in an oval shaped path, where the spine is in line with the crucial binding station. - Calibrated book clamps with 'thickness indicators'. Single knob adjustments leading to easy job change over. - Continuous flow of clamps to the feed-in station with "No book-No cover" system. Our PVC Clamp Binders are the optimum product to store and protect important documents that are frequently used or referred. Made of high quality raw material, these cost effective binders are offered in various capacities . 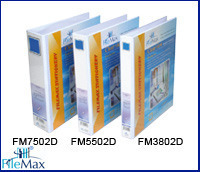 We also specialize in customizing these binders as per the specifications of our clients. Book Clamp easily adjustable with handle and applies uniform pressure on each book. Spine preparation consists of a combination oi notching tool and dust cutters.Tltelteightadjr:stablerou3herringteethensure eflective exposure oi the paper fibre. Hot Melt Roller application system equipped with a roller and scrapper mechanism.